Men vs. Women Nutritional Needs (USA Guidelines) - Gym Training App by Weightplan.com - Gym Training Personal Trainer App - Free Diet & Exercise Tracker, Personal Trainer, workout plans, build muscle, gain fitness and burn calories. ​Energy or calorie requirements tend to be higher for men because they are generally heavier with greater muscle mass than women. Women tend to have a higher percentage of body fat, which is important for reproduction and to make female hormones in the body. Muscle burns a lot more calories than fat, which is a major reason why men usually burn more calories than women each day, and why it’s important for people to maintain muscle mass while losing weight.. Calorie requirements will vary depending on someone’s body size, age, gender, occupational activity levels, and energy used in physical activity. If an individual is very active then their energy requirements will be much higher. 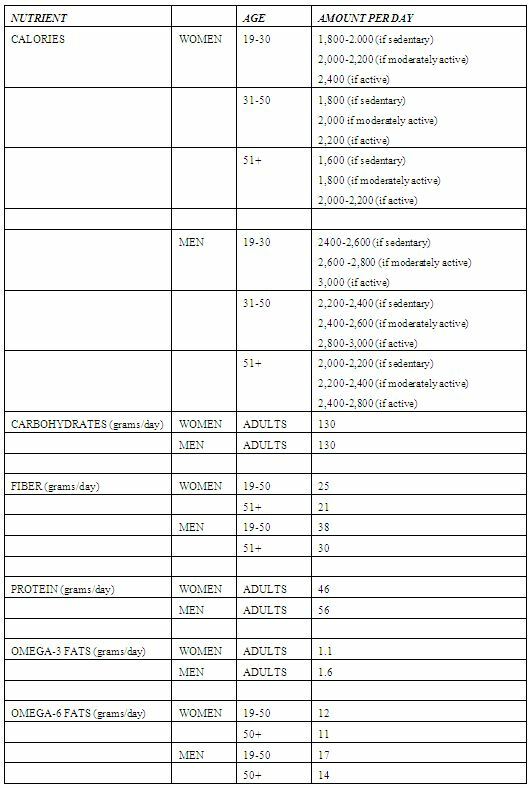 The following tables give generic nutritional guidelines from the.Institute of Medicine. Note that the Dietary Reference Intakes for carbohydrate and protein are based on amounts that meet the needs of almost all the population, and can be more than what many of us require. For example, while an active person might burn up 130 grams of carbohydrate a day (the equivalent of about 9 slices of bread), this is more than some of us need. There is no requirement given for mono-unsaturated fat (found in olive oil, for example) or saturated fat (found in meat, dairy and processed foods) because our body does not actually require us to eat any for our health. There are recommendations given for the polyunsaturated fats (omega-3 and omega-6, from oily fish, sunflower oil and other sources) because our bodies do need them from our diets. In addition, both men and women should aim to keep total fat intake to 20-35% of the calories we eat. This means that a person eating a 2,000 calorie diet should aim for a total fat intake of about 44 to 78 grams per day (based on the fact that each gram of fat contains 9 calories). Saturated fat should be limited to 10% of calories, which would be about 22 grams per day for a 2,000 calorie diet.